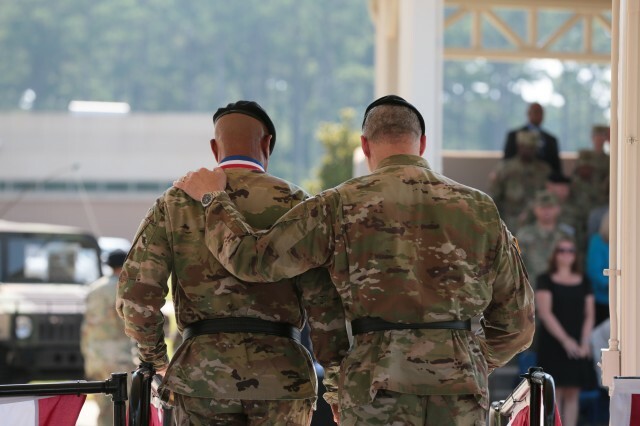 In a retirement ceremony that paid tribute to more than four decades of committed service, the Army Materiel Command and Tennessee Valley community said farewell to a deputy commander who has been known for his compassion for both Soldiers and Department of the Army civilians. Lt. Gen. Larry Wyche, whose 42-year Army career began as a private cavalry scout in 1975, was honored as a master logistician and exemplary leader with three Ruffles and Flourishes, a 15-gun salute and a surprise induction into the Quartermaster Hall of Fame. He also received the Distinguished Service Medal and the General Brehon B. Somervell Medal of Excellence, which recognizes those who excel in the area of multifunctional logistical support and demonstrate a commitment to duty. 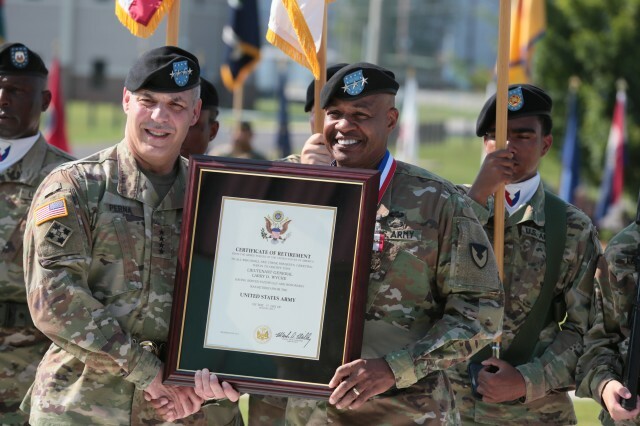 "It has been hard because there are no secrets that Lieutenant General Wyche doesn't know about in this command," said AMC commander Gen. Gus Perna, who hosted the retirement ceremony. "But he did not know about the honor of being inducted into the Quartermaster Hall of Fame." Perna, who has known Wyche for 17 years, said the retiring three-star general focused his career on being a logistician who always ensured warfighters had what they needed, when they needed it. "He cares deeply about people," Perna said. 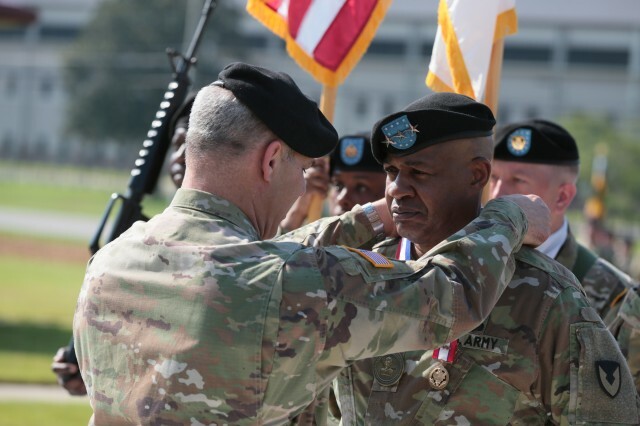 "He is an inspiring leader, wise mentor and true friend … He has committed 42 years of his life to the profession of arms, and has put the needs of the Army and the warfighter ahead of himself." Wyche, who has been married to his wife, Denise, a retired DA civilian, for 37 years, was joined at the ceremony by several family members, including his son, Maj. David Wyche, and his father, Richard Wyche. Above all, Wyche's career not only exemplified the principals of commitment, competence and character, but was also defined by family, selfless service and compassion, Perna said. "When you care about Soldiers and care about people, they have a way of caring about you," Perna said as he looked out to a parade field of several hundred well-wishers and community leaders. In his comments, Wyche thanked his family for their support, and AMC employees for their commitment. He talked about growing up in Virginia and about a childhood memory from 1968 that ultimately influenced his decision to enlist in the Army. "My uncle returned from Vietnam a proud Soldier and a logistician. We were gathered around a wood burning heater and he was sharing his experiences from Vietnam. Then, he told us he had volunteered to go back. Everyone in the room was in shock and they asked him why," Wyche recalled. "What he said, I remember so clearly. 'I am Soldier. My country needs me and I need to be with my unit and my friends.' I can't tell you the impact that had on my life. The foundation my family provided me has sustained me throughout the years." Wyche said it took a bit of time for him to figure out his life's purpose, but with the support of his family and particularly his wife, he came to realize that being a Soldier; serving the nation and defending the U.S. flag; and serving the Army and its Soldiers, civilians and organizations have been his life's calling. "I've worked for so many remarkable organizations," Wyche said. "Those organizations and people will be part of Denise and me for the rest of our lives. I owe so very much to those who saw potential in me, taught me and encouraged me to go the distance. All of you are responsible for the many successes I've enjoyed." Wyche, who has always worn his sergeant rank pinned underneath his officer's uniform, has been guided throughout his career by those early years in the enlisted ranks. "There is a bond of trust," he said. "General [Eric] Shinseki captured it well when he said, 'Soldiering is an affair of the heart.' It starts with love of country and our constitution. What makes the U.S. special, what makes you special, is that we are willing to uphold our values and ideas. "I have learned that Soldiering is driven by a sense of duty and a hunger for justice. It is tempered with honor. It is marked by courage and bravery, and, at the same time, it is infused with mercy and compassion. But what brings Soldiering to life is the teamwork, camaraderie, selfless service and willingness to sacrifice." He referred to the words of Gen. Douglas MacArthur, who wrote 'Duty, honor, country … These three hallowed words dictate what you ought to be as a Soldier and what we can be as a Soldier.'" But, to that, Wyche said he would add a sense of community that helps Soldiers endure the hardships and separations of a military life. He thanked Soldiers on activity duty and the Reserves, retired veterans and tireless volunteers, wounded warriors and the families of fallen service members, military spouses, the civilian workforce, industry and academia partners, and the local community for supporting Soldiers today and in the future. In closing, Wyche voiced the Soldier's Creed and the Army Logisticians creed, saying "We are warfighter logisticians, prepared to give the shirts off our backs, the boots off our feet, to support the fight. We will never say no, as long as we have one bullet to give or one gallon of gas to give."